(Credit: REUTERS / STEPHEN LAM)Apple CEO Tim Cook speaks with Bono from U2 during an Apple event announcing the iPhone 6 and the Apple Watch at the Flint Center in Cupertino, California, September 9, 2014. 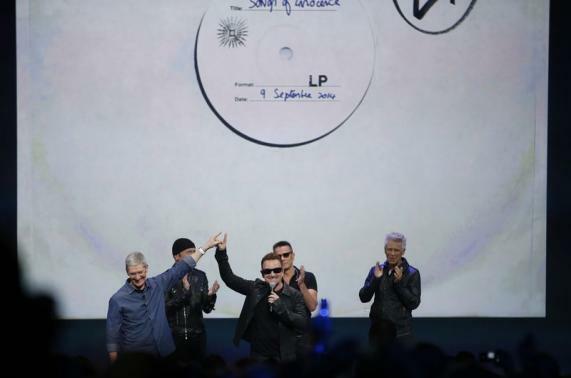 Half a billion Apple iTunes customers have received the latest U2 album, 'Songs of Innocence' for free in what is said to be the biggest album launch in history. "You'll have noticed the album is free ... Free, but paid for. Because if no one's paying anything for it, we're not sure 'free' music is really that free. It usually comes at a cost to the art form and the artist ... which has big implications, not for us in U2, but for future musicians and their music," Bono wrote on U2's official website. According to New York Times, the deal was carefully negotiated by Apple, the band's label Universal and the band's manager Guy Oseary. "This is a gift from Apple to their customers," Mr. Oseary said. "They bought it and they are giving it away." The album is set for worldwide release on Oct. 13, but Apple and the band gave it away in advance and free of charge during the exclusive Apple event that took place in Cupertino, Calif., on Sept. 9. The band members unveiled their latest music offering live on stage with Apple CEO Tim Cook, alongside the big iPhone 6 and Apple Watch reveal. The move was quite surprising, especially after U2's frontman Bono criticized Apple in June saying that the tech giant is "annoyingly quiet" and doesn't do enough to tout the fact that it has raised a large sum of money for The Global Fund. Songs of Innocence is composed of 11 tracks, including: The Miracle (of Joey Ramone), Every Breaking Wave, California (There Is No End To Love), Song For Someone, Iris (Hold Me Close), Volcano, Raised By Wolves, Cedarwood Road, Sleep Like A Baby Tonight, This Is Where You Can Reach Me Now, and The Troubles. The physical release will include a 24-page booklet, a deluxe version featuring four new tracks, and acoustic performances. Songs of Innocence is a product of stitching together U2's influences from the 70s and 80s, home, family, relationships and discovery on the road to global superstardom.